Jake Youmell sports his 2017 Boston Marathon MGH jacket. Emerson director of digital strategy Jake Youmell is running the Boston Marathon this spring, but more than just his distance skills are being put to the test. Youmell’s fundraising strategy skills are front and center as he raises money to run on behalf of Massachusetts General Hospital’s pediatric cancer team in this year’s Boston Marathon. And he’s been creative in his methods, even offering star donors handmade coasters made from real tree bark. The cause is personal for Youmell, 32, whose parents both died of colon cancer. His brother was also diagnosed with the same cancer in 2014, but treatment was successful and he is now cancer-free. Runners for the team must raise $6,000 to participate in the Marathon. Youmell set a goal of $7,000 when he joined the team last fall, and is nearly there—he’s raised $6,000 at press time. Youmell, one of six children in his family, said he got into running partly as a way to cope with the loss of his parents—logging about 10 to 15 miles a week when he first started. He saw the mental health benefits and began partaking in 5K races. Youmell ran the Boston Athletic Association Half Marathon in October, which he said piqued his interest in long-distance races. He began seeking avenues to give back through his running, searching for cancer charities that fundraise through the Boston Marathon. He found Massachusetts General Hospital, specifically its ‘Fighting Kids’ Cancer… One Step at a Time’ team. The program, which started in 1998, is now in its 20th year. 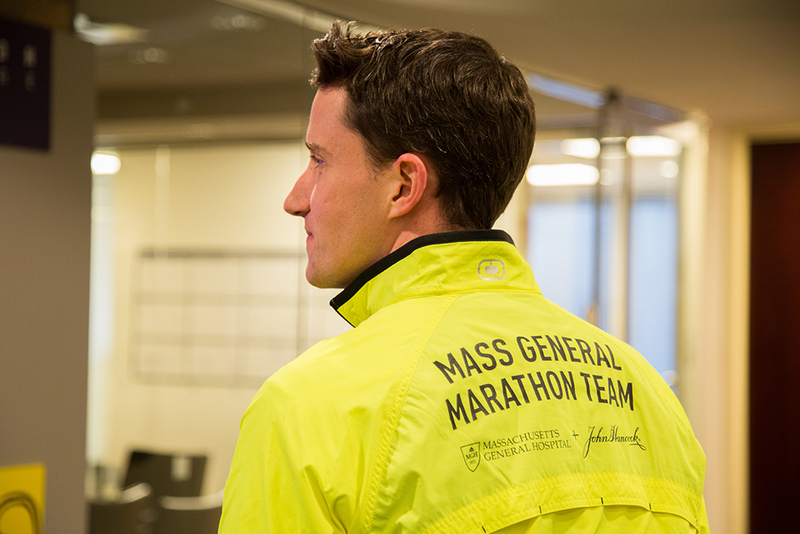 Youmell said he was attracted to MGH because of its cause and size—there are only 100 runners on the pediatric cancer team. Money raised by the team is directed to MGH’s Pediatric Hematology-Oncology department for treatment, clinical trials, research, and the child life program, which focuses on things like art and music therapy to help patients and families during their time at the hospital. The team is confident it will meet this year’s $1 million fundraising goal, said Courtney Earle, the development officer of special events at MGH and coordinator of the team. Youmell’s fundraising efforts have gone beyond the typical—he’s put his woodworking skills to use to craft coasters and a cutting board as incentives for donations. The coasters are made out of real tree bark and wood, and Youmell branded the “Run for MGH” slogan in the middle with a branding iron. He made 26 sets, and each contains two coasters marked with one of the 26 miles that make up the Boston Marathon. The cutting board traces the entire racecourse. Donors who pitched in more than $50 received coasters, and Youmell plans to sell the cutting board to bolster his fundraising total. At one time before he started marathon training, Youmell considered starting a charitable organization and selling similar products, with proceeds going toward cancer charities. Youmell suffered a stress fracture in his heel in November, which has forced him into a tamer training routine ahead of the April 17 Marathon. But last week, he intensified his workouts, starting a walk/run combination. Youmell said he’s less nervous about how the injury might impact his race time because of the cause. “The experience itself with fundraising and being a part of the organization has been so incredible that I’m happy at whatever level to participate,” Youmell said. When Youmell reaches the 20-mile mark on Marathon Monday, he’s expected to be greeted by his patient partner, a 17-year-old boy undergoing treatment at MGH. The patient partner program pairs runners on the pediatric cancer team with a patient, who typically cheers the runner on as they near Heartbreak Hill in Newton, notorious for being a difficult climb deep into the race. Team coordinator Earle, who ran last year’s Marathon and raised over $10,000, said the interaction with her patient partner at mile 20 helped her finish strong. Youmell said he’s communicated with his patient partner by text and e-mail, and the two have discussed everything from college applications to music. Youmell has a degree in music education, and his patient partner is seeking the same program of study.